SINGAPORE - The Founders' Memorial Steering Committee, tasked with conceptualising a memorial to honour Singapore's first generation of political leaders, will soon start a series of eight dialogues to gather views from members of the public. The eight sessions will run from Oct 31 to Dec 15, and those interested can sign up at the new website www.foundersmemorial.sg. Three sessions will be in English and open to all. In addition, one session will be for youth and another for members of the Pioneer Generation. 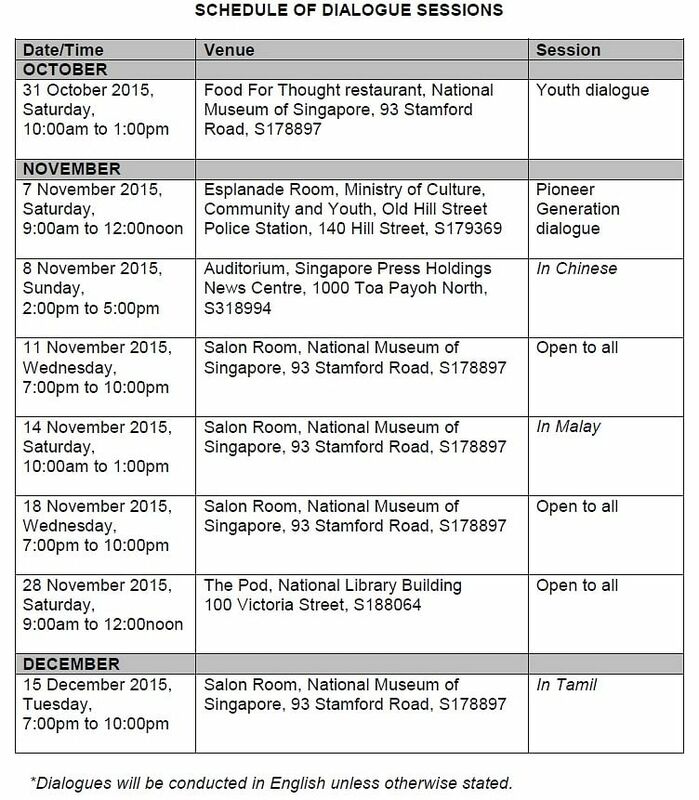 There will also be three sessions, one each in Chinese, Malay and Tamil. Members of the public can also provide their feedback online, using a form on the same website, the Ministry of Culture, Community and Youth (MCCY) said in a statement on Thursday (Oct 15). The committee was formed on June 30 to come up with a concept for a memorial to honour the values and ideals of the founding generation of leaders, and inspire future generations. And its new website seeks views from the public on the type of memorial they would like to see. 1. Why is it worth remembering the values and ideals of Singapore's founding generation of leaders? What are the values and ideals worth remembering? 2. Who would you consider as the founding generation of leaders and why? 3. Do you have an idea what the memorial could look like or where it could be located? The 15-member committee helmed by Esplanade chairman Lee Tzu Yang will also gather views through surveys in the coming months. On top of these efforts, the committee is also intending to hold roundtables with specific groups, such as historians and educators, to seek their views. All this feedback, as a whole, will provide the committee with views from different stakeholders and a wide range of Singaporeans, MCCY said. The committee, which started its work in June, has been planning how to engage the public, as well as conducted pilot discussions in small groups. Its work is expected to continue until the end of next year. Mr Lee Tzu Yang told reporters after the group's first meeting that he had met people who "did not care much or know much" about the development of modern Singapore. But Mr Lee Kuan Yew's death on March 23, however, has galvanised them to "suddenly discover an area to be looked at, explored and debated". And efforts will be made to ensure the late Mr Lee's larger-than-life legacy will not eclipse that of his core team, which included Dr Goh Keng Swee, Mr S. Rajaratnam, Mr Othman Wok, Mr Hon Sui Sen and Mr Lim Kim San. In April, Prime Minister Lee Hsien Loong told Parliament, in introducing the idea of a Founders' Memorial, that the late Mr Lee was always conscious he did not act alone, but was the "first among equals" of a multiracial team that complemented one another and trusted one another implicitly. The memorial, perhaps coupled with an exhibition gallery to educate future generations, was an idea the late Mr Lee himself saw value in, PM Lee added. Meanwhile, the seniors' wing of the People's Action Party - PAP.SG - offered a suggestion last month. It proposed that a memorial park to be set up in Fort Canning Park to honour the founders of modern Singapore, because it is big enough for a proper memorial that can accommodate large numbers of visitors, and with enough space left for future expansion. The site is accessible to the public and was previously a seat of political power. In the 14th century, palaces of former Majapahit kings were on the hill, known as Bukit Larangan (forbidden hill in Malay), and Sir Stamford Raffles built his first residence there soon after arriving in Singapore in 1819, said the PAP.SG. The group, which is chaired by Speaker of Parliament Halimah Yacob, has given its recommendations to the Founders' Memorial Steering Committee.